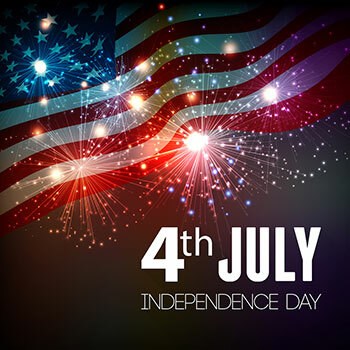 The 4th of July is a holiday filled with fun, festivities, and friendship. It's a holiday meant to be enjoyed, but it's important to make sure you celebrate safely to avoid any unnecessary mishaps that can hamper your good time. Swim Safely. Make sure an adult is always watching the pool if there are children around. Even if the kids aren't swimming, supervision is essential. An accidental slip-and-fall could present an unexpected drowning danger. Enjoy Fireworks with Caution. Fireworks are a normal part of 4th of July festivities, but they're also the reason many people end up in the hospital each year. Amateur handling of these items can lead to any number of dangers. It's always best to attend a professional fireworks display. They're bigger and brighter than anything you can buy in the stores, and they're significantly safer, too. If you will be putting on your own show, make sure it's legal to do so before you ignite a flame. Keep children far away from fireworks. Be sure you're not shooting them off near homes, as they can easily land on roofs and spark fires. Drink Responsibly. If alcohol will be part of your celebration, don't overdo it. Consuming too much alcohol often results in impaired judgment that can present any number of unforeseen accidents. Swimming while you’re intoxicated can be just as dangerous as driving drunk, so pace yourself while you're at the pool. Plan ahead so you have a sober method of transportation to and from your celebration spot; Uber, Lyft, and taxis will be in full-force, so use your resources to ensure a safe arrival back home. A few dollars spent on a safe ride could save you immeasurable costs if you have an accident while under the influence. Be mindful of the dangers of boating when alcohol is involved, as well. Crowded waterways can present special hazards, particularly if your captain has been drinking. Don't forget you can be arrested for being intoxicated behind the wheel of a watercraft just as you can in a car. Don't serve alcohol to people who are under 21. Use Sunscreen. Keep sunscreen in your arsenal, and reapply regularly. If you've forgotten yours, ask a friend. The harmful effects of being unprotected against the sun can last a lifetime. Every skin tone needs protection from UV lights. Hydrate. Make sure you drink plenty of water and electrolyte-boosting beverages. Dehydration can happen before you know it, so gulp a few glasses of water regularly to fight the effects of heat-related problems. Mind Your Food. Cover your food and drinks to discourage bees and other pests from joining the party. Food-borne illnesses can set in quickly in the summer heat. Don't leave your food out for more than an hour to minimize food-related risks. What do you do to keep your 4th of July festivities safe and fun? Share your ideas with us on our Facebook page.